I had intended to begin with local NSW records but I got hooked on the Big Daddy record of global temperature. The Met Office Hadley Centre has downloadable smoothed annual data called HadCRUT4. I plotted the data on this graph. I see five sharp inflection points on this trace, spaced between 29 and 34 years apart. The two negative points, at 1909 and 1975 are 66 years apart, and the three positive points, at 1879, 1943 and 2005 are 64 and 62 years apart. Thus, there is a period of oscillation of about 65 years. Materials linked by Arnost in the second post in this thread mention that this cycle matches the Atlantic Multidecadal (or Meridional) Oscillation (AMO) but no-one pins the inflection points down to these specific years. The straight trend-lines that I have drawn between these inflection points lie very close to the actual data trace. The match is particularly good on the rising trends ("global warming") from 1909 to 1943 and from 1975 to 2005. I have noted on the graph the numerical values of slopes of the trend lines in degrees per century. The cooling trend from 1943 to 1975, which has always seemed to me to lack an explanation, is revealed to be -0.37 degrees per century. I had not been aware of the even stronger cooling trend of -0.97 degrees per century from 1879 to 1909. The cooling trend after 2005 is not yet well supported. The HadCRUT authors smooth with a 21-year binomial filter. Since their last data point is 2012, the last fully-supported smoothed data point is 2002. Their practice is to add ten data points beyond the last, assigned the same value as the last. I believe that smoothed data points are fairly reliable up to 2008, supporting a new cooling trend after 2005, similar to that of 1943 to 1975. Crikey your a gem. As I said I am computer illiterate but that is exactly what I was looking for. It just makes sense to me. Having spent most of my life around water I have constantly seen the effect of converging waves in the sea(ever heard of a rouge wave washing someone off the rocks..it's either stupidity or different waves converging at precisely the wrong time and jacking up right at your feet). And waves are waves are waves imo. It explains why the really biig events are often seperated by hundreds or even thousands of years, because they rely on a precise combination of different influencing factors to converge at just the right time. And what you will often see as the waves get closer and closer to this perfect meeting is a series of steps untill it reaches a peak and then a sudden drop as they pass. The HadCRUT4 data that I graphed this morning is a key feature in the paper by Qian and Lu linked by Crikey. While I think Qian and Lu may well be right that temperatures are likely to fall now, rather than keep on rising, their cyclic curves do not match the observed temperature trace very well. Their Fig. 6(b) compares the HadCRUT4 trace (detrended) with overlapping cosine functions. Yes BG. Your analogy with ocean waves is a good one. This is a good way to explain what is happening at and around the year 2000. When 4 oscillations or harmonic frequencies overlayed at a very close time interval. The time range according to Qian and Ju ( 2010) from 1994 to 2002. When a number of frequencies become synchronized at a maximum or minimum. They are referred to a grand maximums or grand minimums. A bit like your rogue' wave analogy. I suspect that Qian and Ju did not go far enough in determining the key forcing frequencies. Over much longer time scales even lower frequencies can be found . By lower l mean the period of oscillation is longer. Now googling " 1600 year oscillation gives a number of research documents which l will look into more one day soon. pear to be persistent (Bond and Lotti, 1995"
In the context of the year 2000 we are in a positive warm phase of this 1500 year cycle which may work to modulate the current sub minimum downturn this century. Thanks guys re : responses. Dinner is calling and l look forward to responding to all those posts later..
My guess is they are likely to go even longer then a couple of thousand years but I would say that as each occilation lengthens it does so in an almost exponential fashion so once you get past that 2000 year mark the next one might be 10000 years and then maybe 1,000,000 years. We are only around long enough to experience the shortest of the cycles personally and really only have the ability to measure(in a semi accurate fashion) the medium length cycles. One of the most incredible aspects about these oscillations and their frequencies BG ,is that they are constants. Which means they are FIXED values . They don't change over time. This is very useful as you can describe the climate in the past and can also predict the climate well into the future. You only have to extrapolate the cycles to see the future. Now that may seem mind boggling and far fetched but when you consider leading researchers in this area like Vuksevic, scafetta, and qian/lu are able to mathematical deduce that forcings on the climate are extra terrestrial . In other words they have calculated astronomical constants from the planetary motion of the planets in our solar system and our sun. Recent studies on galactic cosmic rays indicate an influence from much further from our solar system. was surprisingly the.. 194 yr oscillation. 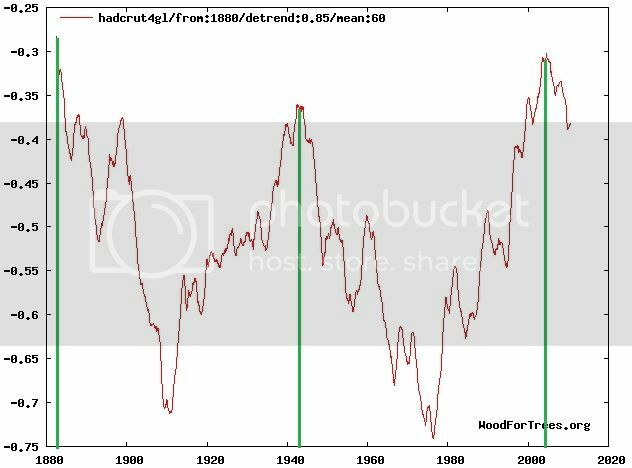 You can see that the Oort, sporer , Dalton, maunder minimums ALL occurred on the minimum of this 194 yr frequency and correspondingly the medieval warm period and the modern warming period since 1900 -2000 for this frequency both occurred at the maximum of this frequency. The 2 superimposed gives the years 900 to 1250 a warm maximum for those 2 longer term frequencies. Multiple harmonics overlayed create square or saw tooth wave patterns. or complex modulations? SB.. Maths is my weakness. I have not done the frequency anomaly time series table yet. SNAFU.. and ROM.. Thanks for your interest . This is my pet topic in the weather world..and all input is appreciated . Ha .. WUWT and J Nova might be interested in my MS paint presentations... Chuckle. THanks for the thumbs up and encouragement. It would be greta if WUWT and JNova managed to get Qian and JU to do a post or article. Now that would be accepted. It did come to my mind that the Chinese are buying Australian agricultural land in case they have to feed there people during this downturn. The 1500 yr cycle is on the up tick since 1700.. So a good period of time on the downslope. We have some reprieve ! Now a few points here. You may have read sweeping statements regarding the IPCC and AGW theory.. However it must be noted. Even though they have a strong case for correlation of high temps in the 1990's and grand warm maximum to explain away AGW. They did nor disprove AGW. I think qian and ju estimated ? the temperature anomaly for each of the oscillations. So shouldn't be too hard to check against carbon 14 proxies which are not influenced by C02? This is a very significant event. and we are privileged to watch this unfold. Its a bit like being alive to watch Haleys comet come around . Except the last time something like this happened was around 1800. 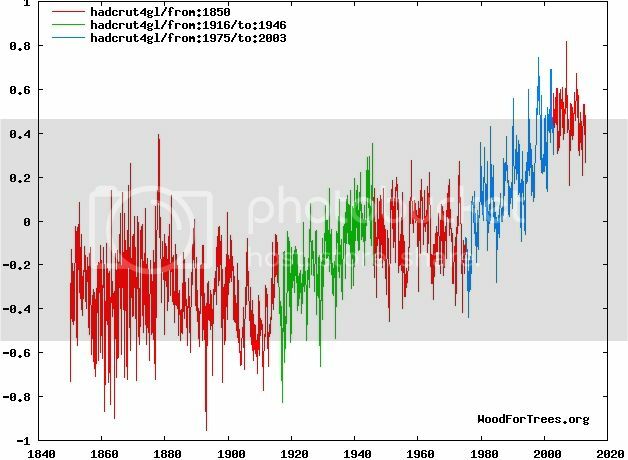 This is somewhat of a ~200 yr event with a maximum of varying intensities but the medieval warm period was bigger..
We are on the cusp of a climate shift of one of the 194 yr peaks. There appears to be little lag at all! How intense downward .. Needs some calculations!! THis would agree with Bill's viewpoint that AMO shifts negative and global temps follow immediately. This is the time to watch the weather parameters change. All these variables potentially change at a climate shift. A great time for weather watching. What was detrended in your temp graph from the wood tress site? That produced the 60 yr frequency? what did you mean by.Qian and ju's results don't match data trace? Hi BD.. This should be a topic you would enjoy. With a solar component.BTW it was your and ROM's initial posts a few years ago that led me to study this topic. So thanks.. There are certainly cycles in the climate. The most recent ones are around 60 years. But one has to be able to forecast them. You need to know what is the driver of the cycles and then have some way to accurately forecast what that driver is going to do. We can't really forecast what the Sun is going to do (there are some theories but I would say they are far from proven). The AMO is another and it seems to be related to OHC in the north atlantic which is now heading down (but nobody has a reliable forecast method). The ENSO? well it oscillates and that is about all we can say. So, we can't tell which way the cycle is going to go now. Anyway, Qian and Lu seem to be able to predict cooling from now on, without actually matching the temperature record in much detail. 2. The current apparent down-turn in the temperature trend is VERY poorly supported by data. There is nothing for it but to wait a few more years. 3. Your animation of a sinusoidal oscillation turning to a saw-tooth wave happens only if you choose the right harmonic frequencies, phases, and amplitudes. It will not arise by chance. I am deeply sorry I ruined the format of this forum page by posting a graph that was just over 600 pixels wide instead of just under 600 pixels. Many thanks for the link, ROM. The graph I mean is on p.4055. That "copy and paste" advice may be the key. In Post #1190821 (above) I showed a graph of smoothed world temperatures since 1850: the HadCRUT4 series. I fitted a series of linear trends separated by sharp inflection points spaced about 30 years apart. These trend lines had very different slopes, making it seem unlikely that world temperature trends at this time scale are largely due to an exponential increase in human-caused carbon emissions. As the broad trend in human carbon dioxide emissions is exponential in time (so far! ), I have plotted the data as logarithms (base 10). This is approriate to compare with linear temperature changes. Each doubling of carbon dioxide would, according to the physical model, add a constant increment in temperature. Like the temperature trace, the trace of logarithmic change in carbon emissions breaks into parts with linear trends. There are only three break points, but each is near one of those of the temperature trace. Break-point dates for both traces are noted on the graph. Each change in carbon emission trend matches a change in temperature trend in the opposite sense, not the same sense as the Anthropogenic Global Warming theory predicts. * When the temperature falls at -0.97 degrees per century from 1897 to 1909, the emissions trend remains at +1.97 log-cycles per century, just as it was before 1897, when the temperature was rising. * When the temperature then rises at +1.47 degrees per century from 1909 to 1943, the emissions trend decreases to 0.28 log-cycles per century. * When the temperature then falls at -0.37 degrees per century from 1943 to 1975, the emissions trend increases to 2.14 log-cycles per century. * When the temperature then rises at +1.91 degrees per century from 1975 to 2005, the emissions trend decreases to 0.77 log-cycles per century. The scatter-plot graph shows that there is an inverse relation between global temperature trends and log emission trends for this data set. The coefficient of determination (R-squared = 0.666) is quite high for observed natural data. Two of the three break-points in the emissions trace lag behind those in the temperature trace: 1913 lags 1909 by four years, and 1945 lags 1943 by two years. The break-point at 1973 leads that at 1975, but the position of the 1973 break-point is not well defined. If a change in emissions lags years behind a change in temperature, it is very unlikely that the change in emissions drives the change in temperature. Humlum, Stordahl and Solheim (2013)also find that carbon emissions lag global surface air temperature. For the years from 1980 to 2010 the lag was 9.5 to 10 months. An ironic fact about the Qian and Lu oscillations is that they remove the global warming trend for the last century and a bit first before doing their calculations. Their oscillations therefore cannot possibly explain this warming trend, although if their oscillations are real they could explain variation from decade to decade around the global warming trend. Are greenhouse gases changing ENSO precursors in the Western North Pacific? Yeah well, nice paper. Too bad it is not accurate. ENSO Trend since 1856 --> ZERO. The paper does not say that CO2 is causing any trend in ENSO. It says something totally different. And the interesting thing about the 0 trend for ENSO is that it seems to hold for both SOI, and nino 3.4. But nino 3.4 is the temperature of the central equatorial pacific water, and the rest of the globe has warmed up. Therefore the nino 3.4 region has become cooler compared to the rest of the globe, and it seems obvious that this change should have impacted ENSO in some way or another.